Brunch doesn’t get much easier or tastier than these 4-ingredient Cheesy Spinach and Ham Egg Cups! Thinking of having friends or family over for brunch? Keep it simple and add this Cheesy Spinach and Ham Egg Cups recipe to the menu. Perfect for groups because you can make as few or as many as you like, these baked egg cups (or egg muffins, if you prefer) always disappear! These Cheesy Spinach and Ham Egg Cups require no chopping. NONE! And with only 4 ingredients (plus cooking spray, salt and pepper, if you’re actually counting), this baked egg cup recipe can be on the table in 30 minutes. I almost always prep these egg muffins ahead of time and pop them in the fridge until baking time. 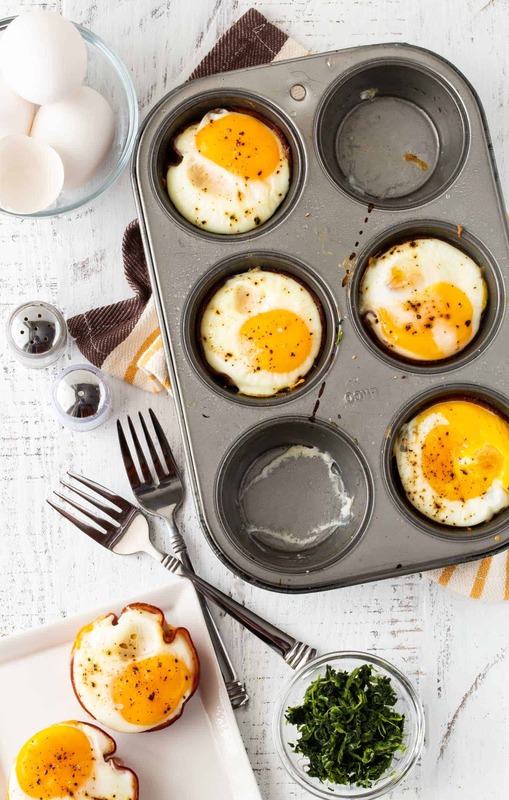 Plus it’s easy to double this egg cup recipe if you have a large group or very hungry guests. Simply prep another muffin tin and bake them at the same time. You might have to add another minute or two to the baking time because of the quantity in the oven. 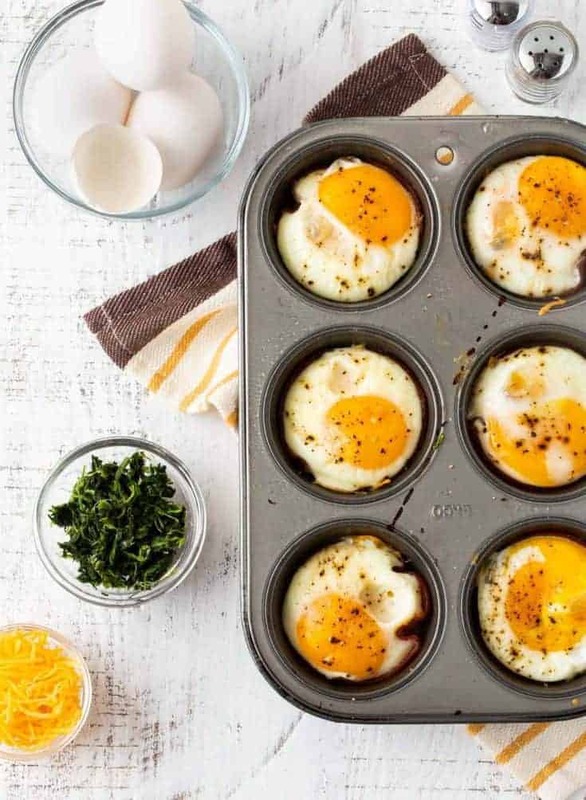 On the flip side, you can also make this egg cup recipe in small quantities if it’s just you or a few others trying to get out the door in the morning. I’ve even prepped these ham and egg cups the night before and kept them in the fridge (covered) until baking in the morning for a warm, healthy breakfast that keeps us full until lunch. 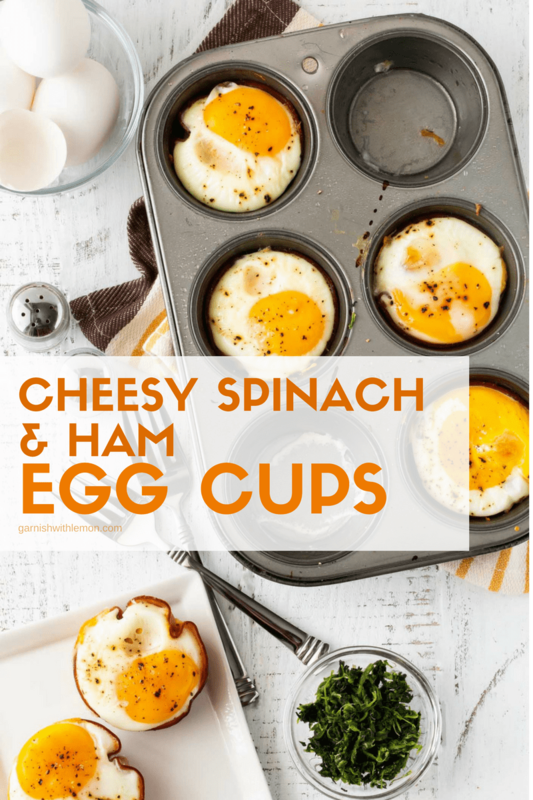 If you love these Cheesy Spinach and Ham Egg Cups, you’ve got to try these other egg muffin recipes! Spray a 12-cup muffin pan with cooking spray. Line each cup with a piece of ham. Divide spinach and cheese evenly among muffin cups. Crack an egg into each cup. Season with salt and pepper. Bake for 20-25 minutes, depending on how done you like your eggs. Cool slightly, remove from pan and serve. Um, do you deliver?! I need these for breakfast ASAP! I’ll trade you a Cheesy Ham and Spinach Egg Cup for some of your Olive Oil Granola….sound fair? 🙂 Thanks for the comment, Ashley! Do you drain the spinach? Hi Marion, good question! Yes, I do drain and squeeze the spinach mostly dry before adding it to the egg cups. I’ll add that to the recipe so it’s more clear. So glad I came across this recipe! I’m definitely going to make this, perhaps with fresh spinach instead. Thanks so much for sharing! It’s such a quick and easy way to amp up breakfast. Hope you enjoy, Cheri! Can you use fresh spinach instead? Hi Maria, Frozen chopped spinach is always my go-to because it’s already chopped and ready to go, but if you give fresh spinach a try, I’d love to hear how it turns out!